Style #TIB503 Black tie tuxedo for sale and rentals in Miami. 2018 New Italian Men Slim Fit Suit by Carlo Pignatelli. Elegant hand finish tailored black Ceremonia fitted suits, made with new Italian fashion fabrics. Call for information. Walk-Ins-Welcome, we will dress you in 10 minutes for tuxedo rentals. Italian Men Suits. 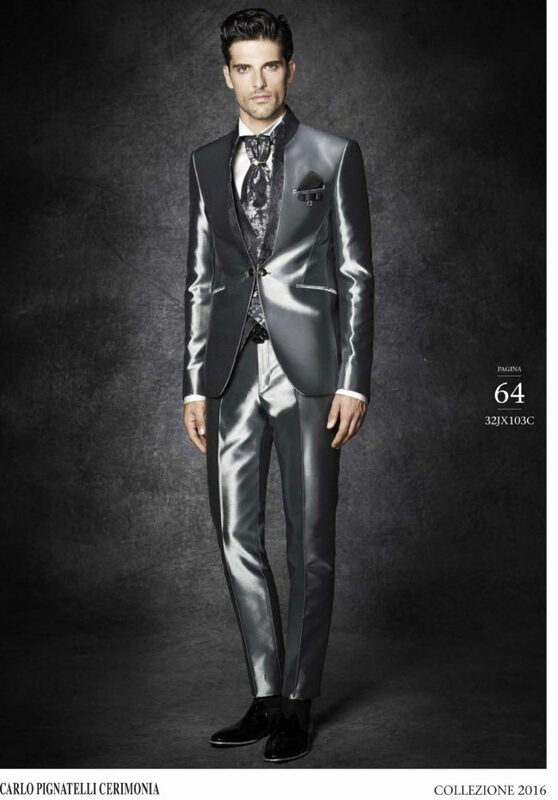 High fashion men slim fit Ceremonia suit. Coordinated waistcoat and cravat tie. A spectacular wedding attire to make your special event the grand day that it is. Product: Style #TIB503 Designed and made in America. Product: Ike Behar, black notch lapel: Classic Tuxedo, super 120% wool. Product: Tuxedo sale price $495. Category: Italian Men's Suits, Tuxedos. Tags: Carlo Pignatelli, Italian suits, Ralph Lauren. Black Tie Tuxedo Rentals Miami. Tuxedo available for sale and rentals. Large selection of tuxedo and suits for rental and sales. I & A Formalwear and Tuxedo Accessories offers Italian Men’s Slim Fit Tuxedo and Ceremonia suits, waistcoat and cravat ties for last minute formal wear needs. We have been serving satisfied customers since 1985. We are committed to supplying superior quality tuxedos and excellent services. Our staff is friendly, knowledgeable, and dedicated to providing exceptional last-minute services. Black Tie Tuxedo Rentals Miami. I & A Formalwear and Tuxedo Accessories carries a large selection of styles and colors to choose from in-house. Walk-Ins are welcome and we will dress you in minutes. We carry a full line of Retail Tuxedos and Accessories under designer labels, whether the customer is seeking refined classics or is looking for a modern edge. Miami Men Formal Tuxedo Rentals. Our in-stock inventory includes blazers, trousers, suits, formal wear, vests, formal shoes and European and hand-made in USA cravats, as well as cotton and silk shirts and tuxedo accessories to complement your Tuxedos or Suits. In the world of fashion, Ralph Lauren, Perry Ellis and Ike Behar are uniquely American classics. When the occasion is black tie and formal, like a wedding, prom, or dinner party, the style and classic elegance of European and American designers are always in fashion. There are many distinctive styles to choose from, so that you can find exactly what you want. Of course, a silk Italian fitted shirt, formal designer shoes, cravat or bow-tie, vest, and jewelry will be the final touch. The next time the occasion is special and the dress code is formal, contact us at I & A Formalwear and Tuxedo Accessories. Always make a classic and elegant statement about what you’re wearing.